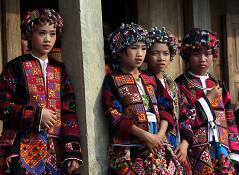 Vietnam's northern mountainous area, the homeland of an array of colourful ethnic minority communities. The scenery is superb! The complex lifestyles of the several different ethnic minority peoples living on the series of plateaux on Vietnam 's Central Highlands. The least visited areas of Vietnam: striking area of limestone hills, rivers, thick forest, wildlife and small ethnic minority villages. 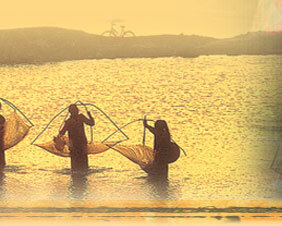 An odyssey through the rich variety of northern Vietnam 's many and varied ethnic minority communities. Working with the villagers from time to time - a close-up to the people and their cultures. 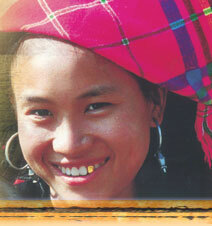 Tailor-made tours to Vietnam to explore some of our fifty-three ethnic minority communities. If you enjoy unusual holidays or exotic vacations that involve getting to grips with other cultures and totally different lifestyles, travel to Vietnam - you'll love meeting our many ethnic minority peoples! Most Vietnam travel companies include visits to minority villages in their package tours, but our tailor-made private tours to Vietnam and itineraries go deeper into Vietnam's ethnic minority cultures. They're the real McCoy - unusual holidays with authentic experiences. ‘Unusual holidays’ can mean roughing it somewhat. The worst-case scenario is communal sleeping, basic or non-existent sanitation, rock-hard beds, no electricity, and plenty of walking. If you can cope with that, you’ll come across some of the friendliest and most hospitable people and spectacular scenery in Indochina - exotic vacations indeed! The ethnic minority area around Sapa is the most commercialised, but tourism has hardly spread further than its environs. The views from the town across to Mt. Fansipan are superb, and the ethnic costumes are a riot of colour! Head further west into Lao Chai province, and you’ll find remote villages hardly touched by tourism. The northeast mountains have the least experience of tourism, so you're likely to find only the the most basic levels of accommodation. A tour towards the Chinese border is real exploration – exhausting, but rewarding. The minority people of the Central Highlands differ considerably from their northern counterparts not just by ethnicity, but also by a lifestyle adapted to the climate of the broad plateaux on which they live. Their ethnic costumes are less vibrant than those in the north, but the fascinating buildings and traditions more than compensate. Responsible tourism - the way we work! Although they live in some of the most beautiful scenery imaginable, Vietnam's ethnic minority communities are among the poorest people in the country. 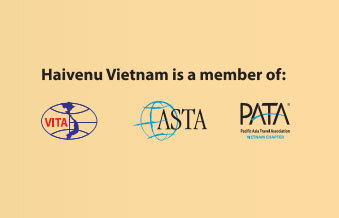 Unlike many Vietnam travel companies, we believe our tours to Vietnam should be more than exotic vacations that concentrate on sight-seeing and taking photos of ethnic minority life. 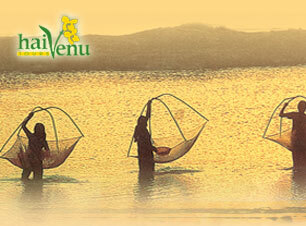 Travel to Vietnam with Haivenu, and you’ll get to know about, and if you wish, have practical experience of what it’s like to live in a grindingly poor village set in magnificent scenery.